Veronica Darling: Meet Doris Day! We have a new friend in the Darling Household! She's Doris Day the Dog! So much alliteration! Doris is a Staffy cross, was found wandering without a microchip, tags or collar in a country town and was probably in the pound and the shelter for close to two months, where no one claimed her, called for her and it just breaks my heart because she was obviously well loved at some point... she has a really sweet temperament! The dog shelter peeps and their vet pinned her at around 2 years old, and she does have a puppy floppiness to her at times... however they reckon she's fully grown and she's a small dog now! She's not as stocky as most Staffies and I reckon she's got Jack Russell heritage as well. So far she's settled into our new home ok, and we'll just have to see what funny things she gets up to! Let's hope the puppy 'chewing my shoes' stage has passed! I've set up some house rules, and the bedroom (and the shoe closet) is off limits... our last dog was tooooo cute and slept in our bed... but new dog, new rules and luckily she's taken to the Charlie Brown Dog Bed and loves it! Oh! And her name? She was named Doris by the lovely dog shelter peeps (because they didn't know her first name), and we thought about it... and couldn't change it. She's probably got an identity crisis as it is, so we just made her Doris Day as what a lovely animal loving woman she is! P.S. I'm going to start replying to your comments in the blog thread - I noticed Blogger finally set this up, that's why I changed back to the old template... so I'll tweak my blog settings a bit... but do you know if I reply to you in the comments, if you get a notification about it? Or do you have to come back here to see if I've written back! Wish I had a bit more time to update to my own domain name, I've just been so busy! OMG she is gorgeous! Have fun with her! Doris Day looks like a real charmer. Congratulations! Oh, she is just adorable...have fun with her! What a sweetheart! She's absolutely beautiful! So glad you guys found each other! aww she is just too cute! I need to switch my template back to basic so I can use the reply things. I would assume if your email is in your profile that any replies to your comments would be emailed to you but I'm not too sure. Let me know when you find out an answer! Hey Kat, Just replying to you here to see if you get a note back in your email? I have a feeling that it's not set up the same as typepad or wordpress... oh well! Congratulations on the new addition to your family. Ms. Day is gorgeous. Enjoy her. She's so cute and I think Doris Day suits her perfectly. Awww, what a lovely dog, and a lovely name! She looks so sweet in her picture! I wish you many happy long walkies with your new friend! I don't know much about how the blogging set-up works either, or whether you get notified, but I think maybe you don't? I don't ever go back to check a comments page a second time to see if people reply to my own comments (I don't have time!) but if somebody asks me a question and it is the only way to answer it (like if they don't have their own blog I can reply on, or if their profile is set to private or something) then I sometimes reply in my own comments section as well. so ADORABLE! my parents have had staffies for years and they are so loving. the new blogger reply is great in theory... but, i don't think peeps are notified if you reply to them. they have to check back in the comments, but it's much easier to see the indented reply at least. you DO, however, get a copy of your own reply (as in you the blog owner) sent to your inbox. which is irritating. CUTENESS OVERLOAD!!! Hello pretty puppy! I feel all happy and gushy - how beautiful that Doris has found your special family, she is one lucky puppy. I bet she already knows that she is at home, loved and safe. How cute are her stand-up ears?! Picking a staffy age would be tricky - they never seem to grow up! People at the park still ask if Hunter is a puppy. He's 4-5yrs, Happy new beginnings to you all! She is gorgeous, I wish you all a wonderful life together, Our pup now 13 weeks is setting in well, although our 3 cats are still not yet sure of her,(even though we shared our house with our dog Bitsy, sadly she she past away last year)Happy is still very much at the chewy stage, but puberty is hitting early and he will gladly hump anyone who sits on the floor, much to the amusment of everyone except the person involed. My first time here. 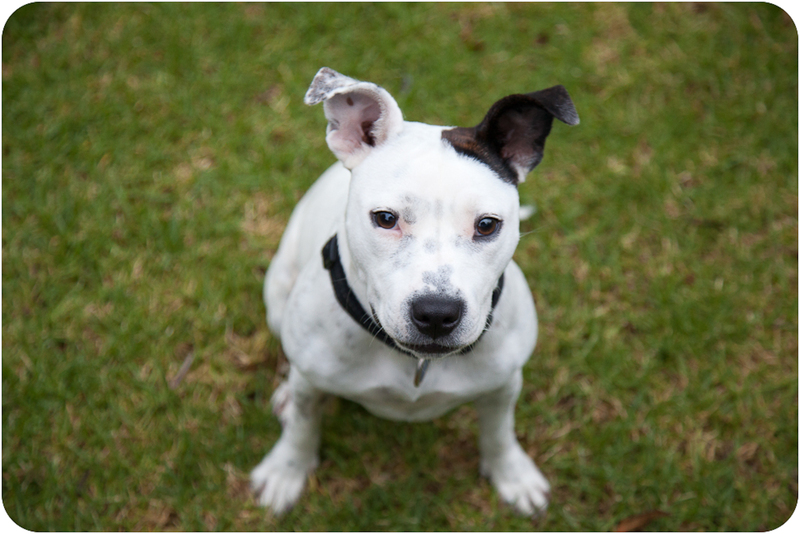 Any chance you have pics of other staffy-jack russell hybrids? Or jack russell-English bullterrier cross. I'm curious to see the result of that match.